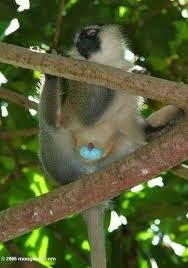 Male Vervet Monkeys have blue testicles. And if the number of google images with them staring in bewilderment at their own nuts is any indication, they are as disconcerted by them as we are. Yup, that goes all the way around. Weird. 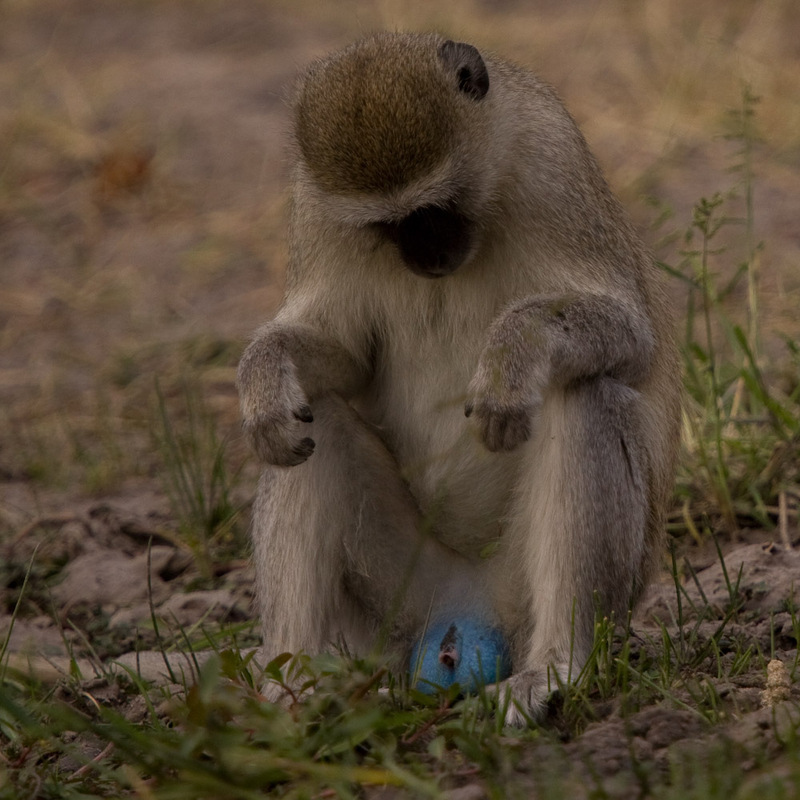 Despite the beautiful blue of their testicles, life is kind of rough and transitory for male vervet monkeys. Their mothers kick them out of the group once they reach sexual maturity so they won't inbreed with their sisters, and after that they have to switch social groups multiple times in their lives. They tend to move approximately every two years, because that's when their female offspring reach sexual maturity - they gotta go before they try to impregnate their own daughters. But why the blue balls?? 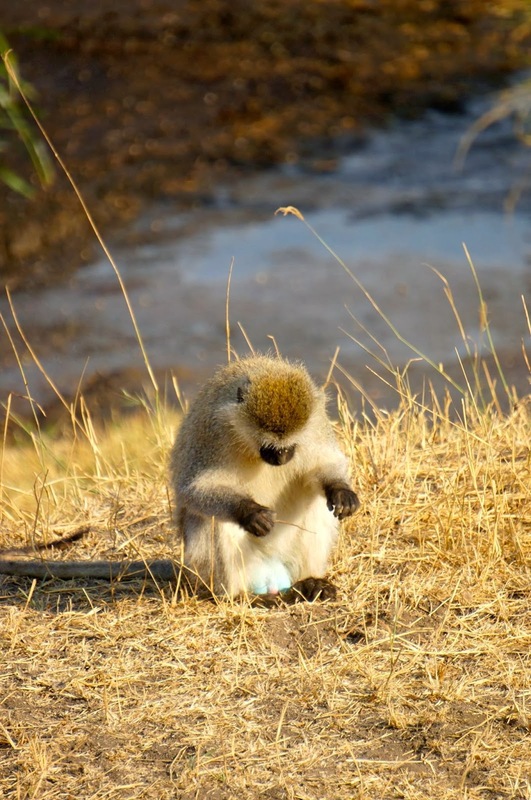 Male vervets tend to sit around with their legs spread to show their brightly colored balls. This splay-legged behavior communicates information about the status between males and is a sign of aggression. Sort of like the human crotch-grab. These displays most often occur when a vigilant male detects males of another group nearing his territory. Male vervet monkeys do not seem to know the lyrics to AC/DC's classic "I've Got Big Balls" (though this has not been empirically tested - COME ON SCIENCE) but they seem to understand the theme pretty well. By showing off his colorful junk, a monkey discourages outside males from joining a group ("this place is a testicle-fest") and reinforces dominance hierarchy among males in his own group. Oh - and just like human balls, they don't get "bluer" when they're not getting any action. "What? Damn it, he tricked me!" And don't forget about last year! Gerald, M. S. (2001). Primate colour predicts social status and aggressive outcome. Animal Behaviour, 61(3), 559-566. Henzi, S. P. (1985). Genital signalling and the coexistence of male vervet monkeys (Cercopithecus aethiops pygerythrus). Folia primatologica, 45(3-4), 129-147. Isbell, Lynne A. "Seasonal and social correlates of changes in hair, skin, and scrotal condition in vervet monkeys (Cercopithecus aethiops) of Amboseli National Park, Kenya." American Journal of Primatology 36.1 (1995): 61-70. Price, J. S., et al. 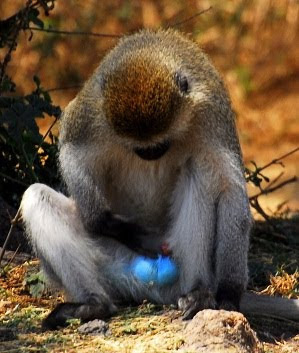 "Control of scrotal colour in the vervet monkey." Journal of medical primatology 5.5 (1976): 296.